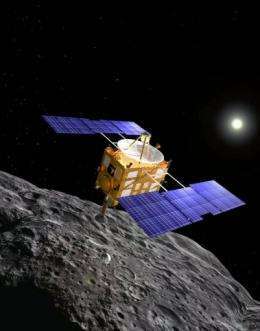 This image obtained from the Japan Aerospace Exploration Agency (JAXA) shows an artist's impression of the Hayabusa space probe deploying one of the surface target markers on the surface of asteroid Itokawa. JAXA has applied for a Guinness World Records listing after Hayabusa returned from a seven-year journey to the ancient asteroid, according to an official. Hayabusa, "falcon" in Japanese, left Earth in 2003 and returned late Sunday, completing a five-billion-kilometre (three-billion-mile) round trip to the potato-shaped Itokawa asteroid. The Japan Aerospace Exploration Agency, or JAXA, on Monday applied to the London-based Guinness World Records to list Hayabusa's trailblazing journey, an official with the agency said. "We are seeking its recognition as the first-ever spacecraft that landed on and returned from a celestial body other than the moon, and also for completing the longest ever (space) journey," the official said. JAXA is not seeking recognition of the total distance Hayabusa travelled as it is a rough estimate and not scientifically important, she said. As planned, the spacecraft burned up on re-entering Earth's atmosphere, creating a fireball in the night sky over the Australian desert. Before its fiery end, it released a heatproof sample canister which scientists hope contains material from the asteroid's surface to give them clues on the origins of the solar system. The pod, which made a textbook parachute landing in the Australian Outback, is to leave Thursday for Japan for analysis.